As the state's efforts to secure churches become more centralized, church scouts play an increasingly pivotal role. WARRAQ — Police personnel stand behind riot shields with machine guns slung over their shoulders at the entrance to a narrow street connecting the corniche to the Church of the Blessed Virgin Mary, the oldest in Warraq, a working-class neighborhood in northern Cairo where a sizable Coptic community lives. On celebration days, 15 police personnel take it in turns to secure the church, while on ordinary days there are only two. But the actual security check takes place further down the street, at the metal detector gate in front of the church, where young scouts check the identities and conduct the frisking of churchgoers. There are about a dozen scouts, most of them students, who are mobilized for such occasions. Easter is the most important festival of the year for Coptic Christians in Egypt. It is also synonymous, like other festivities, with increased risk of attacks. Last year on Palm Sunday, two blasts at Coptic churches in Tanta and Alexandria killed at least 45 people. The Islamic State's Egypt affiliate, Province of Sinai, claimed responsibility for the attacks. Security measures had been in place, but in the days following the bombings, the state decreed a state of emergency for three months, which is still in force. The extra security measures are now a matter of routine: blocked streets near Christian places of worship, checkpoints and walk-through metal detectors. Last Christmas, the government announced the deployment of 230,000 additional security personnel across the country to secure churches. Ahead of Easter, the privately owned Youm7 newspaper reported that the Interior Ministry would block some streets in Cairo up to 800 meters away from churches. The role of the scouts "is to prepare the site and welcome the congregations and the guests," according to Dr. Samuel, who is responsible for coordinating Christian Orthodox Church scouts across Egypt and directly overseeing those who volunteer at St. Mark's Coptic Orthodox Cathedral in Abbasseya, the seat of the Coptic Pope in Egypt and where Pope Tawadros II held Easter Mass on Saturday. Dr. Samuel emphasizes that scouts are not prepared to take part in the security measures. "Our scope of work is not to run security checks." Their lives aren't attached to this place. But in many cases, scouts can stand with police officers at checkpoints, exposed to the same danger. According to Mina Ibrahim, a doctoral fellow at the Orient Institut Beirut who focuses on everyday religious lives in Egypt, the actual role of scouts varies according to the neighborhood and the specific location of the churches, whether on a main road or side street. "When checkpoints have to be far away from churches, a scout can stand with the officer in order to help identify the people who are entering," he explains. "Certain churches also send scouts to watch the streets and detect any suspicious person." At the Church of the Blessed Virgin Mary, which is over 150 years old, the faithful mainly come from Warraq and the neighboring areas of Imbaba or Shubra to listen to the service and meet friends and relatives. Most of these faces are familiar to Samer*, a 24-year-old scout. "Whenever I have time after work I just come here. I know most of the people because they also come on a daily basis," he says passing from one group to another, shaking hands as he goes. "The police alone cannot secure the church because they are outside the community, their lives aren't attached to this place," he adds. "The important advantage the scouts have is that they know the people who come to pray every day," explains Khaled Okasha, a member of the state-affiliated National Council for Counter-Terrorism and Extremism. "The security forces go and speak with the leaders of the scouts to give them instructions. Sometimes, state security asks for their help in coordinating gatherings on the street in order not to have congestion. And regarding bigger celebrations, it is important to have people who know everyone, because most of them are from the neighborhood and go frequently to pray in the church." 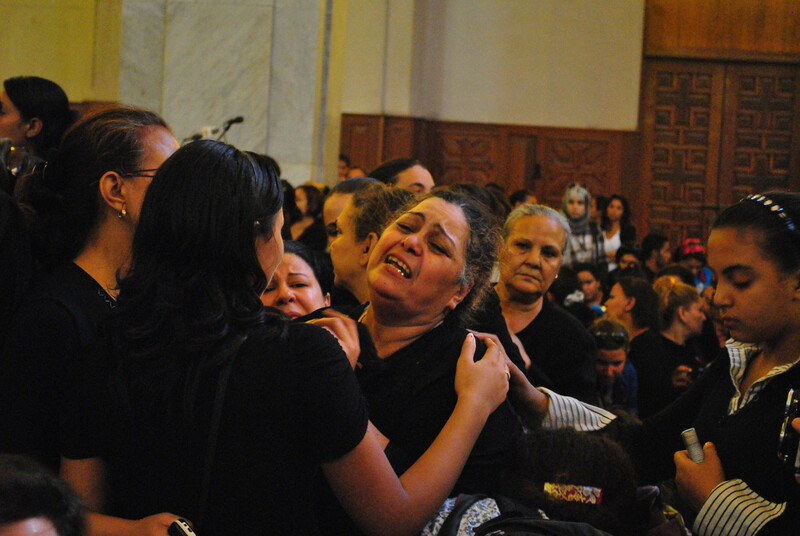 In 2010, a suicide attack on the Two Saints Church in Alexandria killed 21 people during the New Year's Eve service and led Christians to take to the streets in protest against the lack of security. The attack, which occurred on the eve of Egypt's 2011 revolution, marked the return of a large police presence around churches. "Attacks were perpetrated before that in the 1980s and 1990s when Islamist militants targeted Christians and churches, so the state was already placing policemen around them, but after that, their number decreased," says Ibrahim Ishaq, a researcher on religious freedoms at the Egyptian Initiative for Personal Rights (EIPR), adding that after the New Year's Eve attack there was a change in strategy. Observing this shift in the approach to securing churches, Mina Ibrahim notes that "security used to rely more on the informal relationship between each church and the police station of its area. Now, there are a lot of centralized plans led by the Interior Ministry regarding the strategy and the distribution of police officers and they place higher-ranking officers around churches." As the state undertook measures such as closing streets and installing checkpoints at a distance from churches for security checks, "so the scouts started helping security officers in certain churches, even though their role was originally mainly about organization inside the church," he explains. Before each important celebration, Church of the Blessed Virgin Mary scouts gather to train new volunteers. "A few times, the police offered to train some of the scouts in crowd management," says 49-year-old Youssef*, one of the head scouts at the church. "But two of us were trained before and now we teach the others." For him, the involvement of scouts in the security strategy does not cast any doubt upon the effectiveness of the measures taken by the authorities. He says that the number of police around churches is sufficient. "The polices force and the scouts complete each other," he asserts. "The scouts run the identity checks in order to remove that stress from officers, who are keeping an eye on any suspicious behavior. The scouts lessen their work." But the police are regularly criticized for their inefficacy. Last year footage emerged following a deadly shootout in front of a church in the south Cairo suburb of Helwan, which killed nine people before Christmas, showing the police far from the scene of the attack. "The police outside are all for show," contends Boutros, a former scout from Warraq. "If I am a stranger and I pass by, the police would let me enter without a problem. The ones responsible for the security are the scouts. The security forces don't check the people. It's just a façade. Even the security equipment was bought by the church." Father Bashnona, a priest at the Church of the Blessed Virgin Mary, explains that he was compelled to resort to donations for elementary security equipment in response to threats of attacks. EIPR's Ishaq says that he believes it is common practice that churches pay for security equipment, such as metal detector gates and surveillance cameras, although he not been able to fully confirm these reports. He suggests that solidarity funds from other parishes may help individual churches meet costs. The presence of the security forces is always a reminder that there is a risk. In Minya, the governorate which has seen the highest number of sectarian incidents in past years, local authorities offered last year to train scouts. Bishop Makarios of the Coptic Orthodox Church, the bishop of the Minya and Abu Qurqas diocese, turned down the offer arguing that the measure would add fuel to baseless rumors that churches have weapons. In his statement responding to the offer, the bishop stressed that the security of places of worship is the responsibility of the police. The primary role of the church scouts, he said, is not military or security, but rather organization within the church. The idea "is based on training in how to help others socially, gaining personal skills in self-reliance and creativity in many areas, far from policing. "The closure of churches in Minya, whether through attacks by locals or on the part of the security forces themselves, has been a source of tension between governorate authorities and the outspoken bishop. The legalization of Christian places of worship is at the core of sectarian tensions in Minya as the governorate includes the highest concentration of Coptic Christians in Egypt, estimated to represent 30 percent of the population against 10 percent on a national level. Of around 7,000 churches in the country, more than 3,500 of them are awaiting the issuance of permits, according to Ishaq. A long-awaited law on the construction of churches passed in 2016 was criticized by EIPR for codifying discrimination, rather than decreasing it. "It does so by establishing extremely onerous conditions for the approval of new churches and investing the power to regulate the construction of houses of worship almost exclusively in the security establishment, which is a surefire recipe for reproducing the drivers of sectarian violence," according to the EIPR report. While the state portrays itself as a shield protecting Coptic churches, the police presence around churches awakens "contradictory feelings" among the population, according to Mina Ibrahim, which diverges from the unanimous support often claimed by the authorities. "The presence of the security forces is always a reminder that there is a risk, that something may happen," he says, adding that it serves to reproduce the narrative favored by the state, which confines the concerns and vulnerability of the Coptic community within church walls. In that regard, he stresses that the scouts play a role in rendering police presence more accepted. Mariam*, who goes regularly to the Church of the Blessed Virgin Mary said, "With all the police officers around, I didn't feel free while entering and didn't feel like it is my church. I only felt safe once I was inside." *All names of members of the Church of the Blessed Virgin Mary congregation have been changed.